Matthew was great to work with, before and after. He came over promptly and gave us a quote right away. Unlike other contractors, he returns his calls and e-mails. We received 5 different quotes and chose his company for his quote which was very reasonable and his business sense. Matthew and his crew took 5 days to complete the 400 square foot patio and it looks amazing and we are very happy with the outcome. He mentioned to us we needed drainage because we have a pool, so they did need an extra day to complete the job as our ground was hard clay and they had to work so hard to dig the holes. 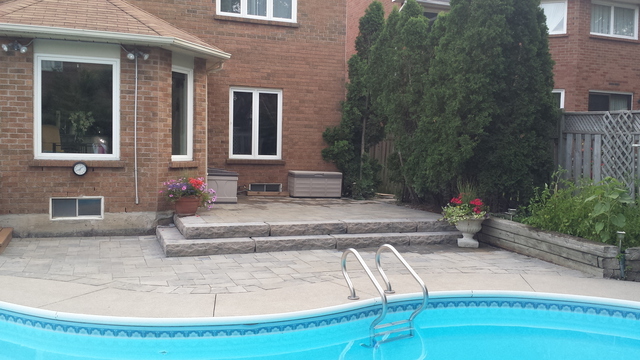 We love our patio and glad we chose Bluestone to do it. We especially love our stone slabs. It looks beautiful. Thanks Matthew!